Over the last decade or so, a new trend has emerged: the “holistic” doctors. They’d usually MDs who claim to be more natural-minded than most. Of course, parents have flocked to them, so heavily that many are booked months in advance or aren’t even taking new patients. But I’m not as optimistic about this trend as I once was. The mainstream has picked up on natural and holistic being very popular, and since they can’t stop it, they want in. Which means that some doctors who really aren’t that holistic are claiming the title and entering the market, essentially taking advantage of natural-minded families. Make no mistake: we need truly holistic options, and I’m 100% on board with that. But families who are seeking holistic care should actually get what they are expecting. That’s why I’ve created this handy guide, to help you know if the doctor you’re considering is truly holistic. I’ve grown quite wary of the “holistic” doctor movement, and for good reason. I’ve seen too many doctors who claim they are holistic turn around and push vaccines, or be totally unfamiliar with actual natural remedies. Some pass on information that is flat-out wrong and could steer people away from good alternative options. These days, a lot of people think “holistic” means using both conventional and natural remedies together. But that’s not what it actually means. “Holistic” is a way of viewing the body as a whole, rather than a sum of parts. Instead of treating someone by saying “Okay, you have a sinus infection, so let’s give you an antibiotic,” the doctor will look at all of the different symptoms, the person’s mood, and treat them based on their specific needs. Simply recommending occasional natural remedies or supplements doesn’t make a doctor holistic. Offering yoga or massage in their office doesn’t make them holistic. These are certainly natural practices, but they say nothing about a doctor’s actual understanding of the body and how they approach health. Keep reading to learn how to tell a true holistic doctor from one who just claims to be! What is Their Main Training? What is your doctor’s major training in? Do they have an MD, DO, ND, DC, etc.? An MD is Western medicine only, so any type of holistic training would be additional or self-studied. A DO has a somewhat more holistic view of the body, but is mostly Western training. An ND is a naturopath and is generally pretty holistic (but nothing is universal!). A DC is a chiropractor, and is also usually more holistic but not entirely — and is trained primarily in spinal manipulation, NOT herbs or essential oils. Just be aware of what a doctor’s training is and what their limitations are. Just because they are experts in one area, doesn’t mean they are experts in others. If one claims to be an expert in things they have no training in (for example, an MD who claims you shouldn’t use herbs because they’re “not properly studied” is not holistic and is not an expert in herbs), don’t listen — or at least verify with another source. What Additional Training do they Have? Has the doctor pursued other training outside of their main training? For example, have they taken classes in herbalism or aromatherapy? What about acupuncture, massage therapy, or another type of body work? The more avenues they have pursued — whether formally or via self-study — the more holistic they are likely to be. However, just because someone has a lot of study or certificates doesn’t make them holistic. Some doctors collect certificates from short courses, but never really change their total view of the body. Which just means they have a little more knowledge, but doesn’t make them holistic. How Do They Treat Common Illnesses? If you go in with a bad cold or cough, what are they going to recommend? A non-holistic doctor will recommend a prescription of some variety. (Cough suppressants, antibiotics, etc.) They may also just send you on your way with nothing, and tell you to use over-the-counter remedies to manage symptoms. They are also likely to recommend treating fevers with medicine as soon as they occur. A semi-holistic doctor might recommend a standard sort of supplement, like elderberry or vitamin C plus rest, with a recommendation to consider a prescriptions if symptoms don’t resolve in a few days. They are likely to encourage leaving fevers alone until 102 – 103, or when a child is visibly uncomfortable. A truly holistic doctor will ask follow-up questions about the type of cough (is it dry or productive; deep and barking or shallow; worse at night or during the day, etc. ), how long it’s been going on, what other symptoms accompany it, and even seemingly obscure things like the person’s mood or sleep habits. They will look at the whole body and recommend herbs, oils, or homeopathic remedies that treat the person, not the symptoms. They are likely to ignore the thermometer and look at the whole child, rather than ever specifically treating a fever. What Do They Believe About Nutrition? A typical doctor will say that nutrition is important, and generally follow government recommendations. They’ll recommend putting toddlers on whole milk, feeding kids fruits and veggies, and avoiding most processed foods. However, they may recommend processed foods for kids who need to gain weight, or suggest that “overweight” babies need to breastfeed less. They will likely not acknowledge the role of nutrition in disease, other than to say that extreme deficiencies can cause illnesses (like scurvy or rickets), but that most children in the US get plenty of nutrition from their diets. A truly holistic doctor will acknowledge that health starts with nutrition, and will work with their patients to find a diet that actually works for them. They will acknowledge there is no universal answer to “best” foods, and recommend strongly against processed foods. They will look to diet first for any chronic health issues and help you make real changes. They may recommend supplements, but they will look closely at their patients’ actual needs, rather than having broad recommendations. They will also choose clean, unprocessed, bioactive forms. How Do They Handle Supplements? Standard doctors will recommend only prescription supplements, or mainstream/over-the-counter supplements, but may also recommend against using them because they’re unregulated or unnecessary. A semi-holistic doctor will probably offer supplements and probiotics in their practice and have standard recommendations for their patients. Some brands will be recognizable, off-the-shelf brands. A truly holistic doctor will recommend higher-quality supplements, and they will be unique to each patient (no blanket recommendations). They will be more likely to use herbs, or even prepare their own supplements. They will adjust patients’ supplements over time as their needs change, and will look at total-body needs. How Do They Feel About Prescription Drugs? A semi-holistic doctor may be more reluctant to write prescriptions, preferring to “wait it out” and recommend typical home remedies first. But, they’re not afraid to write one if they feel it’s necessary. A truly holistic doctor will be very, very reluctant to write a prescription (if they even write any) because they know that most prescriptions fight against the body and there are usually better ways to handle things. They will write them (if they’re able) if all other options have been exhausted, but they will work with the patient to look at total body needs and try diet changes, herbs, etc. first. A typical doctor is in-and-out. Appointments may last 10 – 15 minutes, just long enough for them to do a quick physical exam and answer basic questions. A semi-holistic doctor will usually meet with you longer, at least at first. Appointments may be 20 – 30 minutes, with enough time to talk (and also a physical exam). How Do They View Other Health Modalities? A typical doctor sees him/herself as the authority on health, and will only recognize other Western-trained doctors as experts. May be either scornful of “natural” options, or say “Go ahead and try them but they may not really work.” Believes Western is ‘real’ medicine, and other modalities aren’t legitimate. A semi-holistic doctor believes that other health modalities have some validity, and incorporates some of them into their practice. They may not recognize their own limitations with these “extra” modalities, and may not be able or willing to refer you to a true herbalist or other less-recognized specialties. A truly holistic doctor will recognize their limitations, and be willing to refer you to other health modalities as needed. They may have a network of practitioners they work with, for massage, acupuncture, and other services they don’t provide. They’re more likely to be open to other health modalities and not believe they are the ultimate authority. How Do They Handle Infant Nutrition? A typical doctor may recommend breastfeeding, but ultimately say it’s patient’s choice and under-emphasize the benefits of breastfeeding. They may also be quick to suggest formula if mom is struggling at all. A semi-holistic doctor will encourage breastfeeding and may recommend a lactation consultant if mom is struggling. They will also be supportive of formula if mom expresses a desire. Some will even recommend formula actively to babies with allergies, even if breastfeeding is going well (typically hypoallergenic options). A truly holistic doctor will acknowledge that breastfeeding is the biological norm and will encourage mom to see a lactation consultant, get assessed for lip or tongue ties (in baby), and explore diet changes if needed. If breastfeeding is not possible, s/he will recommend homemade formulas or organic options. How Do They Handle Circumcision? A typical doctor may say it’s parents’ choice, or even recommend for it, based on “medical benefits.” They are likely not informed on intact care. A semi-holistic doctor may say it’s parents’ choice, or may mention it’s not necessary. They may be informed on intact care. A truly holistic doctor will likely recommend against it, but also probably respect a parents’ choice if they do opt for it. They should be informed on intact care. How Do They Handle Vaccines? A typical doctor will likely recommend them strongly, or even insist that patient get fully vaccinated by the CDC schedule or else they will refuse care. A semi-holistic doctor will likely recommend a selective/delayed schedule, or may have nothing to say on the subject. They will probably allow patients to make their own choices. They may also offer homeopathic prophylaxis (“natural vaccines”). A typical doctor will closely follow the CDC growth charts, and will worry if babies don’t stay following their curve. Some will even get unhappy if babies are in a low percentile, and recommend switching feeding methods (even if there are no other concerns). They may also recommend processed foods to “fatten” babies. Similarly, they may give poor nutritional advice if babies are “too fat,” even if they are exclusively breastfed. A semi-holistic doctor will be more relaxed about percentiles, but may worry about babies who aren’t staying on a curve and may recommend supplementing or weaning. A truly holistic doctor will understand that weight gain by itself isn’t that important, and that looking at the baby as a whole is what matters. If they have any concerns about weight, they will also look at sleep, feeding, milestones, etc. for clues. Weight alone isn’t going to concern them. Still not sure, or planning to interview a new doctor? Here’s a list of question to take in! Some of these may not be relevant to you, depending on the age of the person who is going to see the doctor (like the questions on infants wouldn’t be relevant if you’re looking for a doctor for yourself!). What is your training? What degrees or certificates do you have? What is your experience in using natural remedies? Do you recommend them to your patients? How do you feel about prescription drugs? What percentage of your patients are on prescriptions? How do you work with patients? Do you encourage patients to do their own research and make the final decision, or do you prefer that patients simply trust your recommendations? How do you feel about vaccines? Are there any you recommend? Do you offer them in your practice? Do you see unvaccinated patients or have a policy about this? How do you feel about supplements? Do you offer them? Do you have standard recommendations or is it on a patient-by-patient basis? Do you feel like there are any that all people need to take? If so, why? Do you work with or recommend doctors or practitioners in other specialties, such as body work, chiropractic, or herbalism? Why or why not? What can I expect at appointments? How important do you think nutrition is? Is there a diet you recommend to your patients? If so, is it for all patients or do you tailor it to each person? Are you familiar with MTHFR and other gene mutations and their impact on health? How do you feel about infant nutrition? Do you support breastfeeding? How long do you recommend breastfeeding? How do you feel about infant growth charts? Do you worry about weight gain in babies who are otherwise happy, healthy, and meeting milestones? When do you recommend parents bring their kids in for illness? What symptoms should I be looking for? If I have any concerns about my health after hours, who should I call or what should I do? Throughout this conversation, look for answers similar to above — what position are they taking on these issues? Figure out whether they mostly align with conventional, semi-holistic, or truly holistic. Make sure you are comfortable with the doctor’s positions and that you feel you can trust him/her. 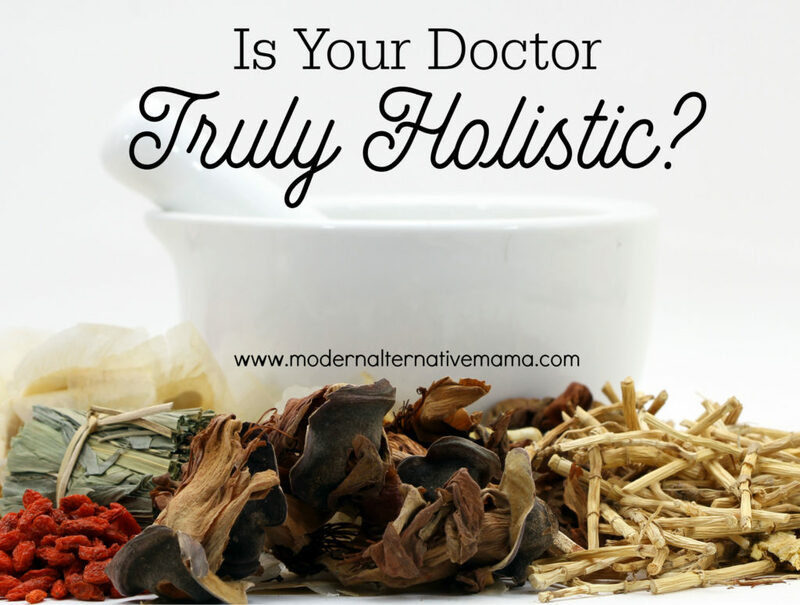 Have you found a truly holistic doctor? This is a terrific article. How can I share it on Facebook or Pinterest? I’m lucky enough to have a terrific ND and semi holistic md for my family . Hi do you have a source for locating true holistic doctors. I’m in NJ and very interested. This was very helpful… thank you for your insights. I was wondering, since it was mentioned in a few places, whether you are in favor of using homeopathy remedies as an alternative to allopathic medicines? I began learning this modality in January 2018 and have been amazed at how much it offers. Do you write about this on your blog? If not, do you discourage its use and if so, why? I’m brand new to your site having come across it when I was looking up WAPF info. I read over your review of them and am discerning much of the sobering disclosures you wrote about. Blessings to you and yours.